Espresso choc chip cookies are a traditional choc chip cookie recipe enlivened by the inclusion of chocolate-coated espresso beans (which you can buy here if you don’t find them locally) and two different flavours of chocolate chips. Caffeine and sugar in solid form for cyclists—what’s not to like? Still, if you’re feeding these to children and don’t want them up all night, you could replace the espresso beans by using 100 g each of dark and white chocolate chips. Pre-heat oven to 160 °C (fan-forced). Melt butter in a small saucepan over low heat, then add to brown sugar and caster sugar in a large bowl. Mix well to form a thick, slightly coarse paste. Beat egg with vanilla bean paste, then stir into sugar mixture. Sift together flour and baking powder and add to the wet mix a little at a time until well combined. 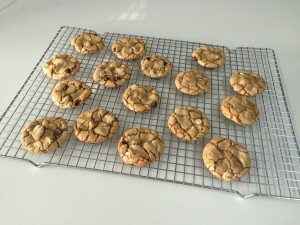 (Important: if you want a chewy cookie that will not be difficult to handle during shaping, be sure to add the dry ingredients a little at a time, not all in one go.) Mix in choc-coated espresso beans, white choc chips and caramel choc chips, taking care to distribute evenly. 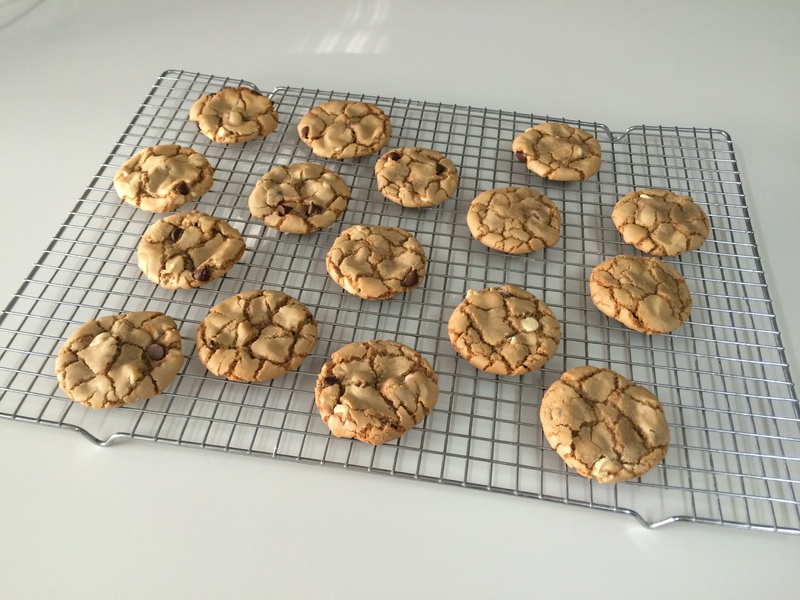 This recipe is so rich in choc chips that it is a little difficult to hold the dough together. Shape into balls, press down lightly to flatten, then bake 12 min on greased, paper-lined baking trays. Halfway through baking, turn baking trays around 180º and switch top and bottom trays if baking two trays at once. The cookies will flatten down as they bake, and crack artistically as they cool. Makes about 35.